Gun Lodged in Motorists Bumper! A driver pulling over to fill up got more than he bargained for when he walked past his bumper. Kinda wondering if any other drivers tried to alert him to the new addition to his vehicle. 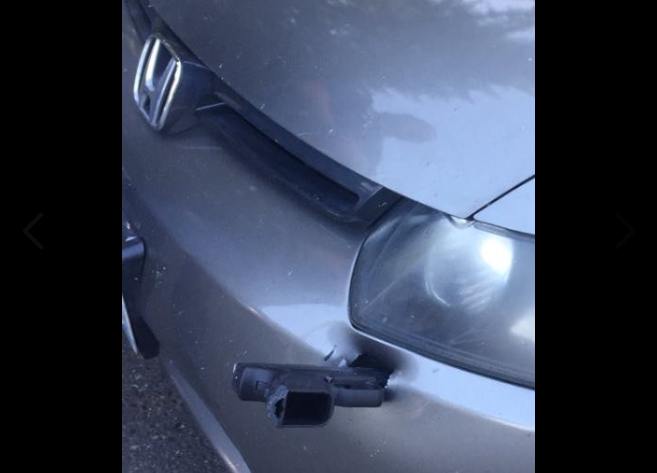 A driver in Washington state made a surprising discovery when he found a gun wedged in his car’s front bumper, authorities said Thursday. The driver was on Interstate 5, when they noticed “a small ‘black object’ flying through the air,” the Washington State Patrol said on Facebook. According to Trooper Guy Gill, the man ultimately kept driving for about 18 miles until pulling over to get some gas where he discovered the weapon lodged into his bumper, just below the car’s headlight. Breaking! Manhunt underway for suspect who shot Tenn Sheriffs Deputy! Army Ranger Tears David Hogg A New One!